Honduran activist Nelson Noe García Lainez was murdered Tuesday, becoming the second member of the indigenous environmental group COPINH to be shot to death in Honduras the last two weeks. He was gunned down upon arriving at his home in the Rio Lindo community in the department of Cortés, less than two weeks after the shooting death of Berta Cáceres, a cofounder of COPINH, el Consejo Civico de Organizaciones Populares e Indigena de Honduras (Justice for the Civil Council of Popular and Indigenous Organizations of Honduras). Local media report that García received four gun shots to the face, and suggest that the attack followed the forceful eviction by Military Police of at least 150 families that had lived peacefully in the area for two years. Telesur and other news outlets report that García was gunned down as the evictions were taking place and that the police evicting residents used falsified documentation to justify them. A former mayor of Rio Lindo, Gaspar Rios, has been linked to the faked orders. The Honduran National Police said García’s killing had nothing to do with Tuesday’s evictions, but few believe that police and other security officers were not complicit in it. Following by less than two weeks Cáceres’ killing and the detaining in Honduras of Mexican environmental activist Gustavo Castro Soto, the Cáceres and García murders add to a series of systematic killings of indigenous and environmental activists in Honduras. According to the Council on Hemispheric Affairs’ director Larry Birns, the Obama administration’s muted response raises concern about U.S. policy makers’ standards on human rights violations: “Washington has maintained democratic lapses in Honduras over long periods of time,” Birns said. Amnesty International has called for action to be taken in response to the killing of several activists including García, as well as the death threats received by other COPINH members prior to Cáceres’ murder. In a document titled “Honduras: Defender Killed, Others Harassed,” Amnesty International cites irregularities surrounding the Cáceres and García killings and well as the detaining in Honduras of the Mexican environmental activist Gustavo Castro Soto. “None of the people whom Berta Cáceres denounced for their constant harassment and threats, including representatives of companies working in the area, have been questioned yet,” Amnesty International says, contending. The report continued, “Since 2011, COPINH members have been campaigning for their right to free, prior and informed consent in relation to a proposal [regarding] the construction of a hydroelectric plant that might force them out of their ancestral lands. 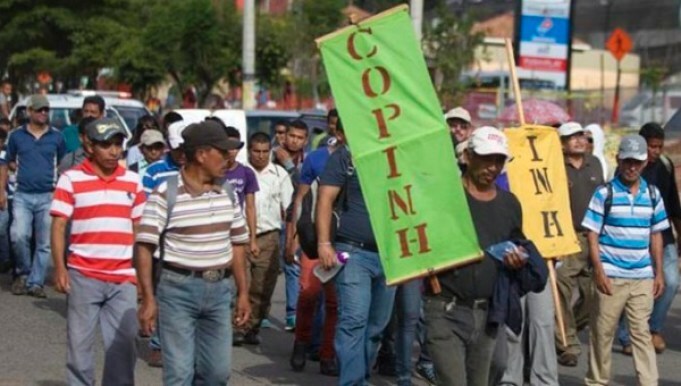 In recent months, members of COPINH have been targeted with repeated threats, and harassment for years, in connection with their work.” Local authorities, however, have not identified the actors of such incidents. More than 700 organizations, scholars, and Latin American academics, including the Council on Hemispheric Affairs, have expressed concern over the Honduras situation in a letter delivered to U.S. Secretary of State John Kerry requesting policy initiatives to ensure that Honduras protects human rights and intends to carry out proper investigations concerning the cases of the slain activists and Castro Soto’s detention. Honduras has long been on a watch list maintained by Latin American countries’ specialists and concerned scholars, not only because the Central American country is generally considered one of the worst human right violators in the region but because it seems to have bought immunity despite these consistent violations. Birns says Washington seems to have crafted a policy selecting certain Latin American countries for special criticism while minimizing systematic killing in others like Honduras. The State Department has not released an influential statement condemning the events in Honduras. John Kirby, Assistant Secretary and Department Spokesperson at the Bureau of Public Affairs in Washington, did condemn Cáceres’ murder and offered “sincere condolences to her family, friends, and the people of Honduras, who have lost a dedicated defender of the environment and of human rights,” and pledged support for justice. Speeches and statements from the U.S. Ambassador to Honduras, James D. Nealon, include a condolence message to Hondurans and the COPINH regarding Cáceres’ killing, contending that the United States is offering the resources needed to bring “criminals to justice.”  Ambassador Nealon marks a sensitivity to Washington’s tolerance for Honduran policies on security forces however it must be questioned if the U.S. is truly approaching the matter to its fullest extent? At the time of the killing, U.S. Representative Steve Chabot, Republican of Ohio and chairman of the House Committee on Small Business, was concluding a two-day visit to Tegucigalpa and met with President Juan Orlando Hernandez. In his trip, he addressed U.S.-Honduran economic opportunities for companies in the United States looking to do business in the Central American country. On the agenda for Chabot and the Honduran president was discussion of further funding for the Alliance for Prosperity plan to promote partnership between the two countries. During Chabot’s visit, he made no regard towards human rights abuses in Honduras. COHA takes notes on the policy of the indifference of Congressman Chabot regarding human right issues occurring in Honduras, whilst focusing on possible venues for the U.S. business interests. Berta Caceres’ murder on March 3 followed by Nelson Garcia’s assassination yesterday, along with the detainment of Mexican Gustavo Castro Soto, represent an ongoing problematic and a series of systematic killing of Central American activists that need to be harshly addressed as soon as possible. Along with the irregular judicial investigations being carried out by the Honduran government regarding the cases, the relatively muted response from the U.S. is continuing to increase questions regarding the White Houses’ standards on human rights policy. Future approaches from both Honduras and the United States, need to be strengthened to demonstrate they condemn the human rights violations and to provide a concrete approach to the deplorable situations occurring in the Central American countries like Honduras. Feature image: SUPPORT COPINH LEADERS: BERTA, TOMÁS & AURELIANO. Taken from JASS. “Asesinan a Otro Activista Hondureño En Desalojo Violento.” Asesinan a Otro Activista Hondureño En Desalojo Violento. Accessed March 16, 2016. http://www.telesurtv.net/news/Asesinan-a-otro-activista-hondureno-en-desalojo-violento-de-la-policia-20160315-0076.html. “Policía Nacional Aclara Asesinato De Nelson García.” Tiempo.hn. 2016. Accessed March 16, 2016. http://www.tiempo.hn/policia-nacional-aclara-asesinato-miembro-copinh-nelson-garcia/. “HONDURAS: DEFENDER KILLED, OTHERS HARASSED.” Amnesty International. March 16, 2016. Accessed March 16, 2016. https://www.amnesty.org/en/documents/amr37/3615/2016/en/. “U.S. Condemns Murder of Honduran Activist Berta Caceres.” U.S. Department of State. March 04, 2016. Accessed March 16, 2016. http://www.state.gov/r/pa/prs/ps/2016/03/253997.htm. “Condolence Message to the Honduran People from U.S. Ambassador James D. Nealon on the Murder of Berta Cáceres, Coordinator of the Civic Council of Popular and Indigenous Organizations of Honduras (COPINH).” U.S. Embassy Honduras. Accessed March 16, 2016. http://honduras.usembassy.gov/sp-030316-eng.html.